The progress element has two simple attributes. 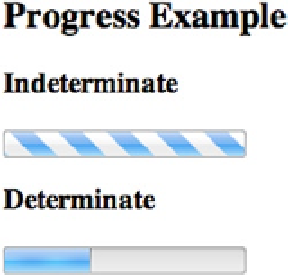 Omitting the attributes will create an indeterminate progress bar. the progress bar. Details about the attributes can be seen in Table 8-3 . Describes how much of the task has been completed. matter how many times the component is used on a single page.